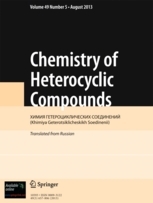 We are proud to announce that our journal “Chemistry of Heterocyclic Compounds” has increased its impact factor from 0.865 to 1.201. This entry was posted on 2018. gada 27. June .